ToyQube has teamed up with Tezuka Productions to release an officially licensed Astro Boy vinyl figure that reimagines the anime icon as the Statue of Liberty! Originally debuting at New York Comic Con 2016 last weekend, the Astro Boy Statue of Liberty features a stylish patina finish and comes holding a torch in one hand and a tablet in the other. The tablet reads “October VI MMVI” or 10.6.2016 – the start of NYCC 2016. The figure comes standing on a Statue of Liberty style base and features articulation at the neck. 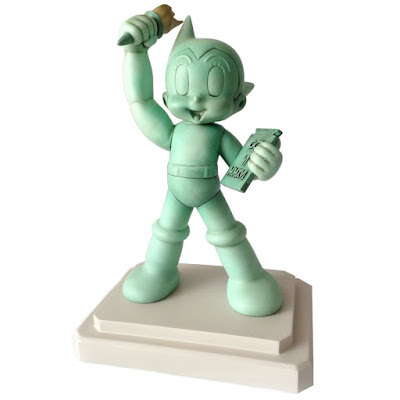 The Astro Boy Statue of Liberty collectible figure is made of polystone and stands 10” tall. Collectors can purchase this awesome figure now at the ToyQube online store for $135.